So here's what you missed on Glee: Glee was a musical dramedy that aired on FOX from 2009-2015 about a high school Glee Club full of misfits trying their hardest to climb the social ladder and make a place for themselves. They had to fight against budget concerns, relentless school bullies, rival glee clubs, cheerleader spies, baby drama, and each other as they worked towards becoming a top notch show choir. Each episode contained a bunch of musical numbers to go along with the current storyline - usually vastly overblown productions that a club with money troubles would never be able to put together. As the years went on and the core group of characters graduated and moved on, the focus of the show shifted slightly, but when it came down to it, it was still a show about a high school Glee club, growing up, and pursuing your dreams, no matter how far-fetched they may be. Kurt Hummel was hands down my favorite thing about the show and the more focus that was placed on Chris Colfer's very capable shoulders the better. Kurt and Burt Hummel's father/son relationship was one of the brightest spots in the show, and when a certain Warbler side stepped his way into ours and Kurt Hummel's hearts in season 2, Kurt and Blaine became the show for me. Glee was far from perfect, but it truly was a trailblazer, and there has never been, and might never be, anything like it on tv again. The creators jokingly said that the finale was called "There's no one left to come out", and that kind of says it all. Glee wasn't afraid to tackle important and hot-button issues, and while it was always to varying degrees of success, they brought things up that other shows wouldn't and started a conversation. For me, and I'm sure many others on a certain side of the fandom, watching a new episode of Glee was not a stress-free event. Being so invested in very few characters and a single relationship in an ensemble show, I was frustrated when the show deviated from what I wanted to see, and worried that the storylines I cared about wouldn't go in a direction I was happy with. With a few years distance from the show, I can say that I get a lot more enjoyment out of the episodes upon rewatch and the annoyance I had with certain storylines and characters has lessened now that the canon is complete. Glee definitely went through its ups and downs throughout the years, both on and off screen, and I had a love/hate relationship with the show for years, but when all is said and done, Glee got it right in the end. I still feel that season 4 as a whole was a giant misstep with splitting the cast, introducing the new kids and putting too much focus on them, and of course the reason for Kurt and Blaine's breakup. However, I did enjoy much of season 5, and I was especially happy with the New York arc that followed that never ending school year of pacing problems. Also, the new characters brought on in season 6 made me care about the Glee club storyline for the first time in what felt like forever, and the last season as a whole was extremely satisfying as a conclusion to this crazy show. For all of its faults and all of the frustration it gave me over the years, Glee was my show. It greatly expanded my music and fan fiction libraries and gave me years of entertainment, even through all of the mixed emotions. It also gave me - and the world - the character of Kurt Hummel and his relationship with Blaine Anderson, a character and an OTP that will remain in my heart forever, so it's really hard to knock it. 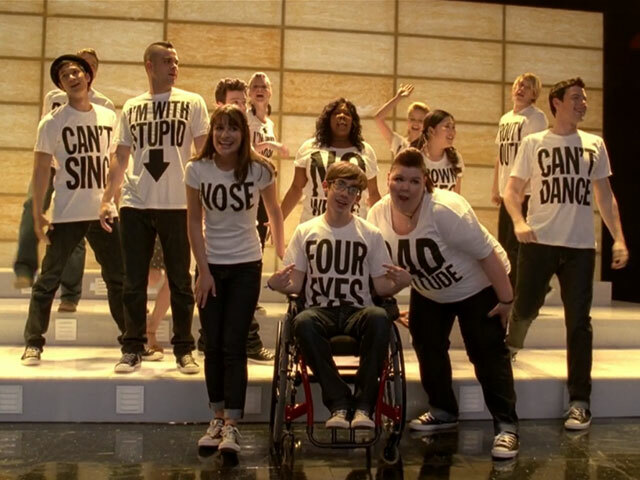 When all is said and done, I will always be a fan of Glee, fearlessly and forever. Solo "Teenage Dream", "As If We Never Said Goodbye" "Defying Gravity (Kurt Solo Version)"
Duet "Baby, It's Cold Outside", "American Boy", "Somebody Loves You" "For Good", "Baby, It's Cold Outside"
Group Song "Bad Romance", "I Lived", "The Happening" "Bad Romance", "It's My Life/Confessions"